LOUISIANA -- A 5-year-old boy is recovering at his Bienville Parish home after a dog attacked him in Monroe. Children were dodging rain drops this Easter for the chance to play outside, but Aiden Stevenson can't go outside to play. 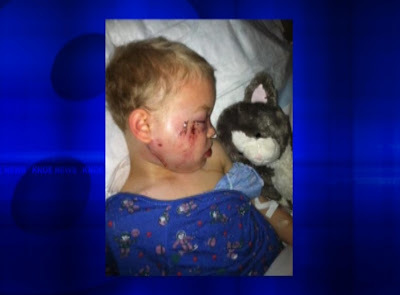 Last week while staying with his grandmother in Monroe, a pit bull attacked Aiden, biting him in the face. "They always tell them not to come back here because they know about the dogs or whatever," says the dog's owner, Chelsea Carter. She says Aiden was playing with her children when they went into the backyard where the dogs were chained. When he got too close, the dog attacked. After two emergency surgeries, it's not over for the Kindergartner. "They went into his jaw, and that's whenever they realized it's not just fractured, it's pretty much crushed," says Aiden's father Joe Stevenson, "the doctor says he will have to have plastic surgery at some point for the scarring, and depending on how the jaw heals, they may have to go back in and do an adjustment there, too." The dog was taken by Ouachita Parish Animal Control to be monitored for rabies, but will be released to its owners later this week. "The only thing they can say is, well, if it happens again we'll put the dog down. Well if it happens again, it may kill another child," says Stevenson. Because the dog was on a leash, animal control officers say no laws were violated. TENNESSEE -- On Thursday, Warren County Executive John Pelham, gave WSMV News a tour of the Warren County, Tenn., animal shelter in response to allegations that dogs at the facility are being neglected, and possibly abused. Pelham advised WSMV News that the dogs who appeared to be starved may have looked that way because the facility had not fed them on the day that they were to be transported to the rescue agency, Big Fluffy Dog Rescue. The explanation strikes most as "absurd." “Dogs don't appear starved after missing one meal. I'm amazed at some of the bone-headed excuses people make when they get caught doing something wrong." 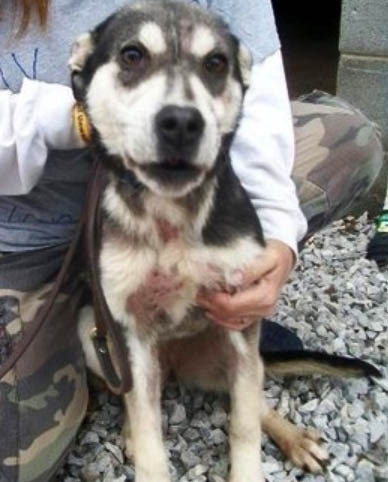 According to the rescue agency which spear-headed the allegations against the Warren County animal shelter, they believe that officials are utilizing "spin control" to avoid the truth. Big Fluffy Dog Rescue noted "lie #1," from the facility is their statement that they have only "euthanized" three animals in the last several months. One of those animals, they admit, was the husky named "Mila." There does not appear to be any explanation as to why Mila's body, which was discarded in "the pit," is bloodied, and why she appeared to have been attacked, rather than "euthanized." 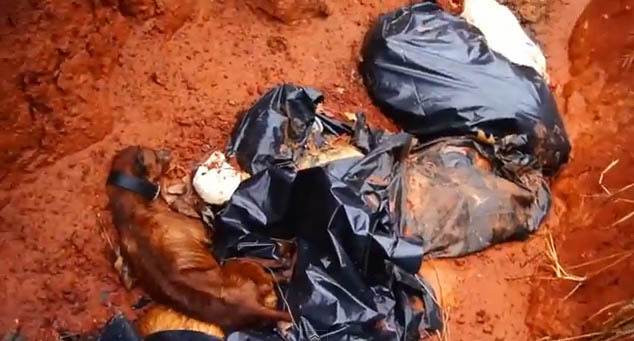 Though the facility officials claim that they have only put three dogs down, the rescue agency has a recent photo of a pile of puppies in the pit behind the facility - puppies who likely were not all "road kill," as the facility contends. Which leads to the next alleged "lie," that the only dogs in the death pit are those which are road kill. One savvy reader of the most recent Big Fluffy Dog Facebook post noticed that the only animals in the pit are dogs - there are no signs of other wildlife which would typically be found as casualties on a roadway. “until they own up to the problem, we will continue to prove that they are lying. This is a game they cannot win." 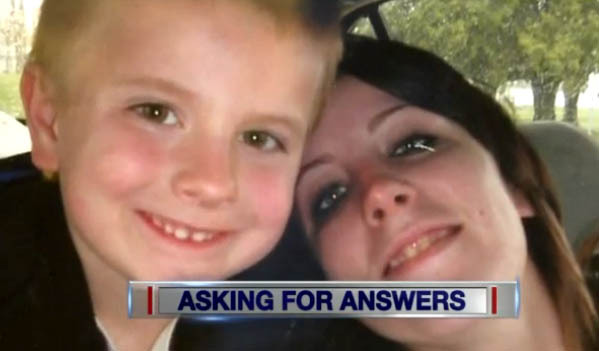 ILLINOIS -- The mother the 7-year old boy killed by a pit bull in Galesburg says she is hoping some kind of criminal charges are filed in the attack. Ryan Maxwell died March 2nd after the pit bull lunged for his throat and face. “I’m angry at myself. I’m angry at the dog. I’m angry at the dog’s owner. Sometimes I’m angry with God, because it’s not fair, it’s not fair, said Sarah Mead, the boy’s mother in an interview Monday with News 8. She says Ryan had gone rollerskating at a local rink for the first time. He was sleeping over at the home, owned by Sarah’s fiancee’s family. “I called him the next morning and he said ‘I want to stay and play longer, Mom’.. I said alright, I love you. He told me he loved me too and those were the last words I said to him”, Mead said. “I thought the dogs were in the garage or in the backyard chained up”, she said, adding there were three other children who lived in the house. Police are still investigating the circumstances that lead to the attack. Ryan’s grandfather Tom Mead says he plans to meet with Galesburg’s mayor about steps that can be taken to strengthen the city’s ordinances. He said he wishes pit bulls could be banned from the city, but outlawing specific breeds is not allowed in Illinois. “Something’s got to be done to stop this from happening to another kid”, Mead said. “My wife and I wake up crying and go to bed crying. There’s just constant sorrow around here. He was the center of everything here”, Mead said. The pit bull was shot by police after he refused to let go of the little boy, and then turned on the officers. “I’ll never know what happened out there that day. What made that dog do that? I feel there needs to be justice for Ryan. Something needs to be done for Ryan”, Mead said. OREGON -- Douglas County Animal Control is looking for a dog that they say bit a woman in Sutherlin on Monday. The County Environmental Health department said a spotted black and white Pit bull (possibly a mix) bit a woman at 8 pm Monday when she was trying to break up two fighting dogs at the corner of W 6th and Grant Street. Officials said they are looking for the dog only for observation, which is required by law. Anyone with information about the dog or its owner is asked to call Environmental Health at 541-440-3574 or Douglas County Animal Control at 541-440-4471. FLORIDA -- How far will a father go to help his young son out of danger? Luis Brignoni, 41, a Bradenton-area landscaper, found out Friday when one of the family dogs bit off his son's pinky finger and swallowed it. Brignoni rushed out to his fenced backyard with a gun and killed the dog, cut its stomach open, and retrieved the digit, carefully sending it with his bleeding son aboard a helicopter to a St. Petersburg hospital. 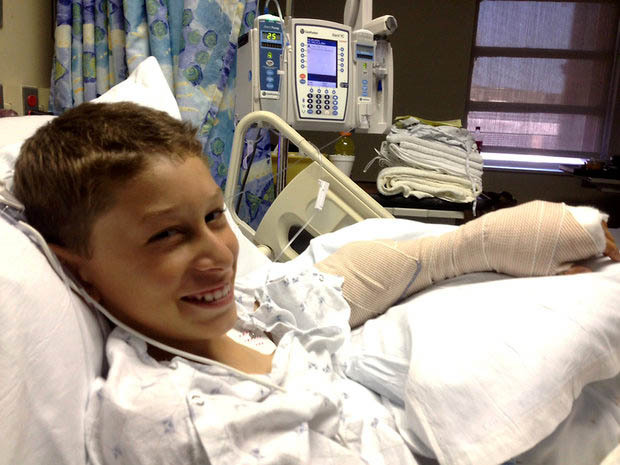 The child, Fernando Brignoni, 11, was later transferred to Tampa General Hospital, where doctors were unable to re-attach his finger during emergency surgery, but the boy is doing well, said his dad today. "You don't know what you will do for your child," the elder Brignoni explained. "You don't know where you get the strength from." 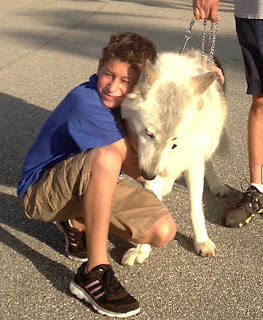 Brignoni, who said he had been a hunter for many years, said his son had attempted to pet the caged dog, a Malamute-wolf mix named Sassy, at about 6 p.m. Friday when the animal grabbed his hand. Hearing screams, Fernando's brother, Luis, 13, hit the dog over the head so it would let go. When Fernando finally got free, the finger had been entirely bitten off, and the dog who had swallowed it was running around the yard. The boy's dad knew he had no choice: "I said, 'I've got to go find the finger,'" Brignoni said. "I got my gun and I popped him." By the time a sheriff's deputy got there, Brignoni was cutting the dog open. Doctors decided that nerve damage precluded the finger's re-attachment, Brignoni said. Brignoni and his wife, Millie, returned to their home on 22nd Street Court East Saturday at 6:30 a.m. after seeing Fernando through emergency surgery in Tampa. On his iPhone, Brignoni carried a picture of Fernando, a student at Oneco Elementary, lying peacefully in bed at the hospital. Deputies said a preliminary investigation supported Brignoni's account of the events, and the incident appeared to have been an accident, according to a release from the Manatee County Sheriff's Office. Manatee County Animal Services took possession of the remains of the dog, the news release said. Brignoni, who is an ordained minister for the nondenominational Love Family Church, planned to postpone Easter services for a week. He recalled that Fernando had mentioned that it was Good Friday, an important day for Christians, when Jesus Christ is said to have died on the cross. "He said, 'Dad, this is Good Friday, and it's not so good,'" the elder Brignoni recalled. 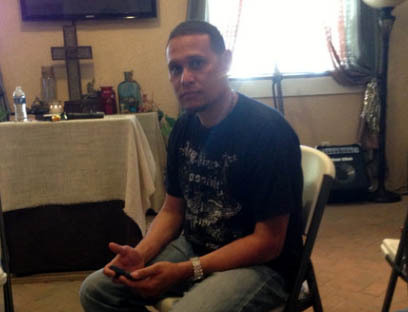 Fernando is slated for release from Tampa General Hospital on Monday, he said. NEW ZEALAND - The family of a woman mauled to death by two dogs on Good Friday say they are "shocked" by the violent incident. They say the loss has shattered the family and they are in deep pain and agony trying to cope. Police confirmed yesterday Chloe Jane Mathewson, 31, was attacked by two of three Rottweilers at the Auckland property where her savaged body was found early on Friday. Her father, Jim Mathewson, said the family was struggling to cope with the shock of her violent death. "We're shattered, just shattered. We're still trying to process everything," he said. In a statement he said, "Chloe is our only much loved daughter and sister to Ben. She was a much wanted child. I was present at her birth and gave her her first feed and we bonded forever. We called her Chloe which is Greek for 'blooming, beautiful'." He said she tragically looked after everyone but herself. "She has had serious addictions which Ben and I have worked to exhaustion to help her overcome. This beautiful young woman, when clean and free from her addictions, would have made a truly positive contribution to our society." The attack was so severe police were initially unable to tell if the dogs had killed Mathewson or mauled her body after she was dead, disguising evidence of a homicide. Detective Inspector Greg Cramer yesterday said a post-mortem examination confirmed Mathewson suffered horrific injuries inflicted by the dogs. "It appears she has wandered out of the dwelling and shortly afterwards was set upon by two of the dogs," he said. Police made no comment on whether Mathewson had been taking drugs. The pilates instructor was a known visitor to the house where she died. A source familiar with the scene said it was his understanding she had gone outside the house on Rodeo Dr in Auckland's North Shore and started dancing, prompting the attack. All three Rottweilers from the property were seized by Animal Control and put down within hours of the attack. The 52-year-old man who lived at the property was "assisting with our investigation", Cramer said. 1969 - farmer killed by a mixed-breed farm dog. 1997 - 59-year-old Te Puke man killed by two bull-terrier-cross dogs. The dogs were trained to hunt pigs, but turned on their owner when he tried to stop them fighting. 2003 - 73-year-old Northland woman dies after being bitten on the foot by one of her three pure-breed Alaskan malamutes. The bite hits an artery and she bleeds to death in her chair. 2004 - 39-year-old Dunedin woman savaged to death by her pet bull mastiff dog. 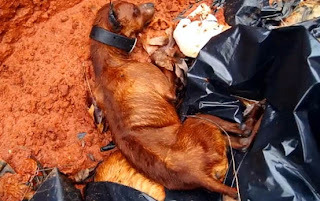 The dog weighed 55kg -- the women weighed 46kg. 2007 - 56-year-old Murupara woman attacked by a pit bull terrier and a staffordshire cross in a suburban street. She loses a large amount of blood and dies of shock in an ambulance on the way to hospital. Dogs killed Jade. They nearly killed our Keiron. Why is no one to blame? UNITED KINGDOM -- THE parents of a toddler savaged by a dog are demanding a crackdown on dangerous pets after teenager Jade Lomas-Anderson was mauled to death. Stacey Drury and Anthony Guess told last night how two-year-old son Keiron is recovering after almost being killed by a neighbour’s dog. And they said Jade’s death showed Britain’s dangerous dog laws need an urgent overhaul so that owners are brought to justice when their animals attack. Stacey, 23, said: “Owners cannot be prosecuted if their dog attacks on private property. “This means that legally no one was responsible for what happened to Keiron, and probably no one will be held responsible for the horrific death of Jade. 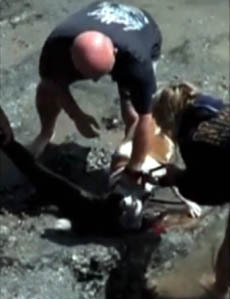 Anthony, 26, added: “We’ve got to make owners accountable for their dogs’ actions. 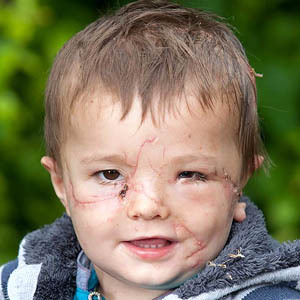 Keiron needed life-saving surgery after he was attacked by a Staffordshire bull terrier in a back garden near his home in Swindon, Wilts, last June. He lost the sight in his left eye and had an ear bitten off. The dog was put down but no one was charged over the attack. Stacey and Anthony joined forces with The Sun to campaign for new laws to prevent a repeat — and last month legislation was passed meaning all dogs must now be microchipped. But Stacey said Jade’s killing by a pack of dogs this week in Atherton, Greater Manchester, brought memories of Keiron’s attack flooding back — and showed the new law does not go far enough. 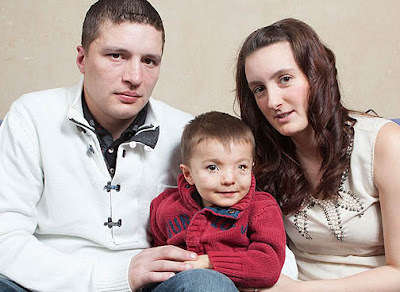 Keiron’s injuries were so severe that doctors gave Stacey and Anthony the chance to say goodbye to their son. Surgeons spent ten hours operating on Keiron to save his life, then put him in a coma for a week to give his tiny body a chance of recovering. 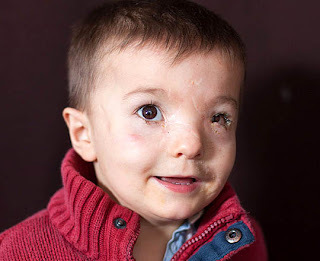 But he amazed medics by battling through, and has since undergone TEN operations to rebuild his face. Keiron, who has a four-year-old brother Mackenzie and a baby sister Holly-Marie, still faces another series of ops — including one to reconstruct his ear. Stacey said: “We were devastated to learn he would never be able to see out of his left eye, and that’s it for the rest of his life. But we focus on the fact he survived. "The dog tore Keiron’s face to pieces"
NEW ZEALAND - Two large dogs that mauled a pilates instructor to death have attacked before, police say. Chloe Jane Mathewson, 31, of Rosedale, was found dead with horrific injuries on the driveway of a semi-rural property in Redvale. The Herald on Sunday understands she had been visiting a friend, Andrew Wai Poi, 52, who owned three Rottweilers. Detective Inspector Greg Cramer said closed-circuit TV footage revealed two of the dogs attacked Mathewson as she left the house on Friday morning. "A post-mortem examination carried out (yesterday) confirmed Chloe suffered horrific injuries inflicted by the dogs," Cramer said. Police ruled out their initial suspicions of homicide yesterday. Cramer said the dogs were removed by Animal Control and destroyed. A source said the same dogs had previously attacked a neighbour's cattle, inflicting "nasty injuries" on the stock. He said the police inquiry would focus on the culpability of owning dangerous dogs. "It is hard to believe the harm that dogs cause to innocent people yet the dog lobby put huge pressure on the Government to water down our dog control laws," he said. Mathewson's former boss at In Shape Studios, Helen Chisholm, said she was a "super" pilates instructor who would be missed. 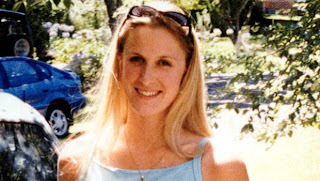 "It is absolutely horrific and our thoughts are with her family and friends," Chisholm said. Police said it was too early to confirm whether charges would be laid or not. 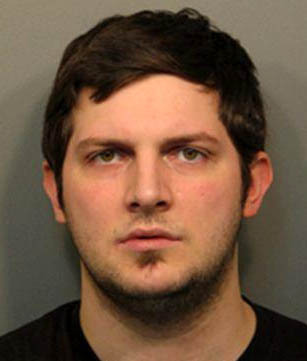 ILLINOIS -- A 22-year-old Illinois man is accused of strangling his girlfriend's cats to death over a nine-month period. John Talmo of Arlington Heights admitted he 'lost his temper' after the three cats scratched or bit him, according to Assistant State’s Attorney Moe Ahmad, leading to their barbaric death. In June of 2012 authorities say Talmo was watching his girlfriend's cat named Princess when the cat killing started. When Talmo's girlfriend returned home he told her the cat had died suddenly while in his care, the Chicago Tribune reports. Four months later in October authorities say he strangled and beat a second cat named Abigail to death. Talmo was charged with aggravated cruelty to animals. A judge set bond at $125,000. 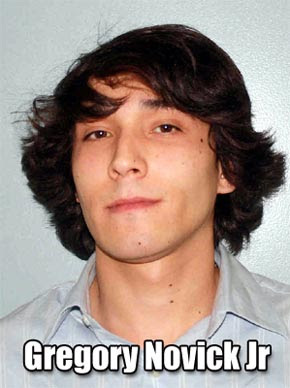 Talmo’s next court date is April 12. 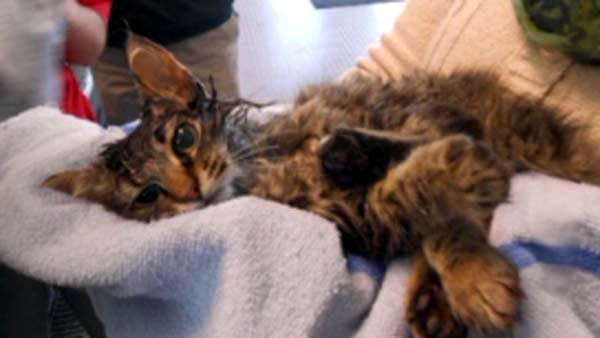 IOWA -- A man's routine oil change caused one cat to scratch off one more of its 9-lives. Mike Kerkman drove 45 miles to get his oil changed. 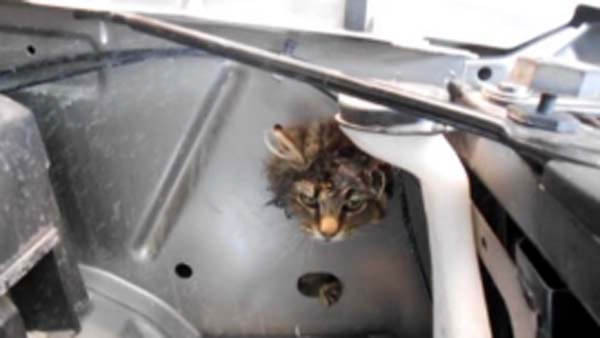 When he got there, "They opened up the hood and there was a cat with its head sticking through a little hole," he said. 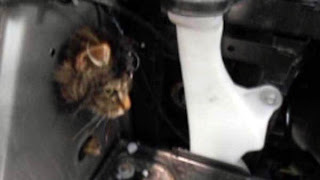 The cat had gotten stuck in a hole under the hood, by the washer fluid. "He was scared. He was almost like choking. His head was the only thing that could get through that hole," said Bob Rorich, a service technician at Norfolk GM Auto Center. Operation "Kitty Rescue" took about 90 minutes. A local vet was able to provide a sedative to make sure the cat got out safely. "The cat was just in frantic. It was in distress. It needed to relax and calm down, so when in that situation, the best bet is to sedate the cat," said Tabitha Streeter, an employee at the body shop who had previously worked at a vet clinic. After removing the front bumper, cutting a bigger hole in the metal around the kitty's neck, she was removed from the car. She's back home now chasing mice. "I just kept going, 'Oh, what's this going to cost me?' They go, 'Eh don't worry about it!' I walked out of there. I didn't pay anything," Kerkman said. Norfolk GM workers named the cat Sierra after the type of vehicle she was stuck in. FLORIDA -- An 11-year-old boy has been hospitalized after a dog bite at his home that severed a finger. It happened just after 6pm Friday at a home in the 5200 block of 22nd Street Court East in the Oneco area. According to the Manatee County Sheriff's Office, the boy reached to pet the dog, who was in its cage, through the slots in the cage door. The dog bit the boy's left hand, completely severing the pinky and possibly breaking his forearm. The child's father then removed the dog from its cage and shot it multiple times, killing it. While waiting for EMS to arrive, he retrieved the finger from the dog's stomach. The boy was flown to All Children's Hospital in St. Petersburg via helicopter. There is no word yet on his condition. Deputies say an initial investigation supports the father's account and they believe the incident was an accident. The dog's remains were taken into possession by Animal Control. RHODE ISLAND -- A Central Falls man is charged with animal cruelty and illegally breeding pit bull dogs within the City of Central Falls, where police have seized three of the dogs. John Montegio, 38, of 352 Central Street surrendered himself to police late Tuesday afternoon, police said, after they received information from the animal shelter in Attleboro about possible breeding of pit bull puppies in Central Falls, where police say that it is unlawful to own pit bulls. Police said that they found three pit bull puppies at Montegio’s address, said Detective Jeffrey K. Araujo in a statement. Two of the dogs appeared to be adults, and it seemed as though a female recently bred a litter. A third dog, a puppy noticeably had its ears recently docked. They appeared to be infected with open sores and dried blood. Citing the Central Falls Vicious Dog Act, officers seized the dogs based on the visible injuries to the puppy, and issued Montegio a summons to appear in municipal court. KANSAS -- For years, the wails and cries of dogs troubled residents of one Kansas City, North, neighborhood. The noises came from inside a garage and from behind that home’s privacy fence on an otherwise quiet cul-de-sac. Numerous calls to the city about the home reported suspicions of animal abuse and neglect. Neighbors said they sometimes glimpsed dogs inside the garage hanging by their necks. Because they were pit bulls, neighbors suspected that the dogs were being used for dogfighting. Those suspicions turned out to be well founded, according to allegations announced this week by federal prosecutors. The man who kept dogs at the house in the 8100 block of Northwest 81st Place was one of two men accused in federal court of participating in a large-scale dogfighting operation. Pete Davis Jr., who was arrested last weekend at a Texas dogfight, has been prosecuted several times in Kansas City for violating city animal ordinances. In one 2011 incident, one of his pit bulls ran loose and attacked two small dogs being walked by a woman and her 7-year-old daughter. As the pit bull tore first at one and then the other puppy, Oude Alink fought to pull her dogs away. She didn’t have time to consider personal safety. After neighbors helped subdue the female pit bull, Oude Alink wrapped her bleeding and whimpering pets in towels. A friend drove her to an emergency veterinary facility. There, after the adrenaline rush of the fight, Oude Alink shook so hard she couldn’t fill out paperwork or dial a phone. “It was definitely terrifying,” she recalled. Davis was fined $400 after pleading guilty to a charge related to that attack, according to court records. After being sued over the incident in small claims court, he also was ordered to pay $800 to cover Oude Alink’s veterinary bills. Federal prosecutors in Kansas announced on Monday that they had charged Davis, 38, and Melvin L. Robinson, 41, with transporting dogs in interstate commerce for the purpose of animal fighting. The charges carry a maximum penalty of five years in federal prison. Between them, the men owned approximately 60 pit bulls kept mostly at a northern Missouri farm owned by Davis, according to federal officials and court documents. The confiscated animals are being cared for by the American Society for the Prevention of Cruelty to Animals. Federal officials identified Davis and Robinson as residents of Kansas City, Kan. 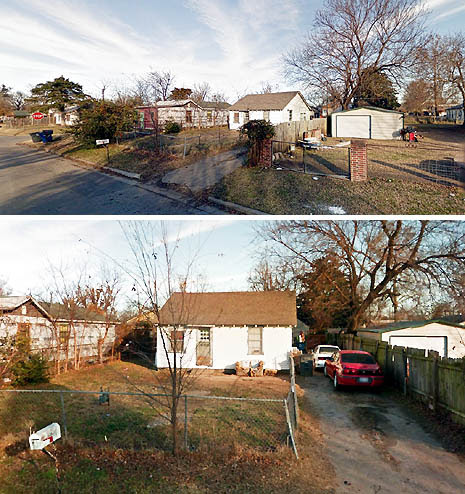 But records show that Davis maintained the Kansas City, North, residence near Park Hill High School. 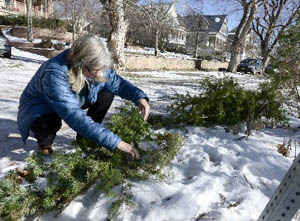 Davis’ treatment of animals had been a “sore spot” in the neighborhood since he moved in five or six years ago, said a neighbor who did not want her name used out of fear of retaliation. City records show that animal control officers were called to the house numerous times to investigate complaints ranging from animals being left for days at a time without food and water to dogs running loose to the attack on Pixie and Peanut. The most recent call occurred last July when animal control and police officers were sent to investigate a report of a dog in the yard without water. According to a Kansas City Animal Health and Public Safety report, the officers impounded a male pit bull they found in the fenced-in yard and freed a puppy whose chain was entangled in brush, preventing the puppy from reaching a water bowl. As the officers were leaving, the owner arrived and questioned whether they could impound the adult dog, the report says. They told him they could, but when they attempted to speak with him further, he would not answer their knocks at the front door. Another complaint alleged that six pit bulls were being kept at the residence and that dog feces was being thrown into the yards of neighbors. Responding officers reported finding no one home and leaving a notice on the door. Several other calls resulted in dogs being impounded, according to the reports, including one “aggressive” female that had been running loose. Besides the incident involving Oude Alink, Kansas City Municipal Court records show three other convictions against Davis for violating animal ordinances. Those cases involved an animal running at large, an unlicensed animal, and no spaying and neutering, according to court records. Dionne Scherff, who represents Davis in the new federal case, said she hadn’t received any paperwork from prosecutors yet. But she said Davis understands the seriousness of the charges and the defense is preparing to go forward. Officials with Kansas City Animal Health and Public Safety said dogfighting allegations are difficult to prove short of catching participants in the act. Owners can be cited for cruelty if officers see evidence of physical injury to a dog. Those who organize animal fighting can be “pretty smart” in concealing their activities from authorities, said Patrick Egberuare, manager of the Animal Health and Public Safety Division. Kansas City police and his division recently held preliminary talks about forming a task force to investigate alleged animal fighting, he said. The dogfighting Davis and Robinson are accused of participating in occurred on Sundays at the northern Missouri farm, according to documents filed in the federal case. Northland neighbors said that every Sunday morning “like clockwork,” a number of vehicles would arrive and depart from the residence on 81st Place. “We used to joke that it must be fight day,” said a neighbor who did not want her name used. Despite the suspicions, the neighbor said she never saw a treadmill at the Kansas City, North, home like the one federal prosecutors described being used to train fighting dogs at a residence in Kansas City, Kan. It was Labor Day weekend in 2011 when Oude Alink had her frightening encounter. Peanut and Pixie had been presents for her daughter’s 7th birthday. Mother and daughter were on a walk near their home with the pups when the unattended pit bull came around a corner. It charged and seized Peanut by her head, “thrashing her around like a rag doll,” Oude Alink said. Oude Alink fought to pull her dog away from the pit bull. “We were playing tug of war with my puppy,” she said. When the pit bull let go, Oude Alink tossed the pup over a picket fence. By then the pit bull had grabbed Pixie and was shaking her back and forth. Again, Oude Alink struggled to pull her dog free. When she did, she threw it over the same fence. Northland neighborhood in September 2011. But Pixie ran right back out. And Peanut stuck her head between the fence slats and “locked jaws” with the much larger attacker. By then, neighbors who heard Oude Alink screaming ran out and helped subdue the pit bull by sitting on it until animal control officers arrived. Pixie and Peanut needed severe lacerations stapled and stitched. Since then, Oude Alink’s daughter has refused to take the dogs on walks unless her father accompanies her. Oude Alink said the pit bull was focused on her dogs and never tried to bite a person during the encounter. “I was lucky. I know that could have happened in a second,” she said. She never talked to Davis afterward except when they met with a mediator after she sued him. “He never offered an apology,” she said. NEW JERSEY -- Police say a small, mixed-breed dog, named Gaby, died Wednesday after it was attacked by a pit bull in a retirement community in the township. Police said they were called to Cambridge Court in the Original Leisure Village around 8:45 a.m. Wednesday, after the attack occurred. The owner of a 10-year-old pit bull, named Buka, walked out of her home Wednesday morning, but her door did not close completely behind her, said Detective Capt. Paul Daly. He said the dog pushed its way out of the door, around the same time a neighbor was walking the smaller, 8-year-old dog. The owner of the pit bull told police she suddenly heard her neighbor screaming, then saw the small dog in her dog’s mouth. Gaby was brought to the Point Pleasant Veterinary Hospital, where it died from its injuries, police said. The owner of the pit bull told police she no longer wanted the animal and surrendered it to Lakewood Animal Control to be euthanized. ALABAMA -- Although a city ordinance bans pit bulls and other "dangerous dogs" inside city limits, recent incidents have raised concerns about the animals. Mary Margaret Hampton on Thursday told city council members three pit bulls belonging to a neighbor entered her yard twice since January, killing her Siamese cat and a Chihuahua puppy. "They tried to attack me," Hampton said. "They tore the gate off the porch and tried to get into my house." On Wednesday, a Jefferson County deputy sheriff shot a pit bull that lunged at him in Center Point. The dog was one of three that chased a woman into her house, said Chief Deputy Randy Christian. Another of the dogs was captured. After Hampton's cat was killed, the neighbor's dogs were quarantined and the owners were told they had a week to get rid of the animals or a citation would be issued, a deputy told city officials Thursday night. Despite the warning, the animals were later brought back. Mayor Tom Henderson said that happens all too often. "Write them a citation right then. They're illegal period," Henderson said. "You have to issue the citation to get the court process started," said Council President Roger Barlow. Council member Linda Kennemur, chairwoman of the public safety committee, said the issue would be a good topic of discussion for the next community watch meeting, being held Tuesday at 7 p.m. at City Hall. The city Council in 2008 passed what it calls a "dangerous dog ordinance" that outlaws the keeping of pit bulls and any dogs "with a propensity, tendency or disposition to attack unprovoked" or any dog that is aggressive by nature. OKLAHOMA -- People in Mannsville said stray dogs are attacking their family pets. Residents said a growing number of pit bulls are running loose in their neighborhood. Cathy Hudson said she's lucky her dog Buster didn't die last year when a pit bull attacked him when he was just four months old. Neighbor Krystal Carroll wasn't so lucky. She said she and her son watched in horror last Saturday when their dog was killed in an attack. "There was a dog at one end of my dog and another dog at the other end of my dog, and they just tugged it," said Carroll. Hudson said she and several other residents have tried to contact the Sheriff's office when a family pet was attacked by a stray, but they've gotten no help. "We have had incidents here before where we've tried to call the Sheriff's office. We've tried just about everything we can and we've had no response," said Hudson. We contacted the Sheriff's office today and were told no one was available to speak about the issue. Many residents said they're even afraid to go for a walk in their own neighborhood. Carroll said her dog was on a leash when it was attacked. "We're scared to walk because the pit bulls are attacking our pets right now, but it will get a child next because once the pit bull gets a taste of blood it's ready," said Carroll. Hudson said all she wants is for people to take responsibility for their pets before it happens again. "If you're not going to have control over your animals, please for the sake of everyone else, don't have them," said Hudson. Hudson said officials have scheduled a town hall meeting for April 8th to allow residents to voice their concerns. 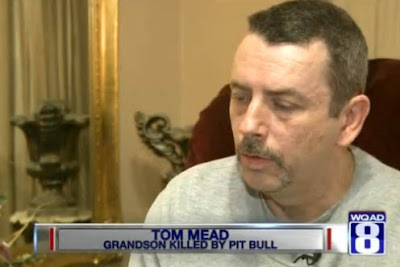 VERMONT --- The Select Board issued an order that a local pit bull be banned from public parks and schools and restricted it to being leashed and muzzled while outside after hosting a “vicious dog hearing” Thursday during which they determined the pit bull had killed a neighbor’s Chihuahua on March 21. The hearing was very unusual for Manchester. Ivan Beattie, chairman of the Select Board, said there hadn’t been another one in the town in the 30 years he’s been on the board. After hearing from both the town’s animal control officer, Manchester Police Officer Craig Watros, and the pit bull’s owner, Vanessa Roberts, the Select Board issued an order about the pit bull, Dozer, who has been in the town’s custody since March 21. The order called Dozer a “considerable enforcement issue” and said Roberts had not been compliant with the town’s dog ordinances. Watros, who has been the animal control officer for 18 months, said he had received about 20 complaints about Dozer. 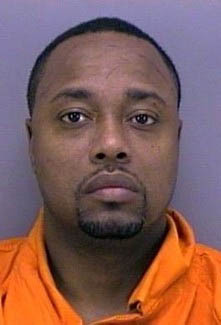 He said during the hearing that he has written five tickets related to Dozer and impounded him at least four times. The order, which will remain in effect for the rest of Dozer’s life, bans the pit bull from public parks and school properties. Dozer must be leashed and muzzled while outside and can’t be around children except those who live at Roberts’ home. The Select Board also ordered the police to “enforce this order with vigilance and the highest level of commitment” and set the fine for violation of the order at $500. During the hearing, the Select Board, which was meeting for a quasi-judicial hearing, received testimony from Watros, Roberts, Joanne Corey, who reported the attack on her son’s Chihuahua, and others. Sgt. Patrick Owens, of the Manchester Police Department, presented the department’s case while Roberts, who appeared without an attorney, represented herself. Corey said she was leaving her home March 21 when she saw Dozer, a dog she knew, attacking one of the three Chihuahuas who live in her home. She said Dozer had been at her home before and attacked one of the Chihuahuas as least three times. Corey said she took the dog to the police department to report the attack and then to a veterinarian. When she got home, she got a call from the veterinarian’s office and learned the dog had died. Watros said he checked with the veterinarian’s office and learned the Chihuahua had been bruised and had a bite wound. 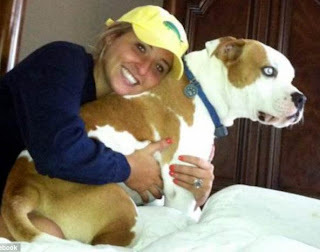 While he testified that he had no conclusive evidence that the bite had come from Dozer, Watros said he was told the bite mark was consistent with the bite mark of a pit bull. Watros also told the board that he had never seen Dozer be vicious. On March 21, Watros led Dozer to the police car and the dog went inside without incident. Roberts, her father and a neighbor testified that Dozer was a gentle dog who was not aggressive with other animals or children. According to Roberts, who called Dozer “her baby,” the pit bull had not left her home March 21. Town Manager John O’Keefe said the Select Board had taken action according to the town’s ordinances to place restrictions on the dog. Board members would not have been able to order Dozer euthanized unless he had been accused of biting a human being, O’Keefe said. CANADA -- Antoine Tremblay, the Quebec zookeeper who was attacked by a Siberian tiger at a Lac-St-Jean area zoo this morning is expected to live. Normally, the zoo’s Siberian tigers — two males, one female and two cubs — are kept in their nighttime enclosure while their daytime pen is cleaned. The zoo is investigating why that wasn’t the case this morning, and are waiting to speak with the zookeeper, who was the only witness. "We're trying to understand how this happened. Right now our main focus is towards the employee and his family, obviously, and also for the rest of the employees that are quite disturbed by the event,” Gagnon said. Paramedics were able to attend to the victim after the tiger left the area on its own. Zoo officials said the tiger was put into an isolation pen, and is not expected to be put down. Quebec's workplace health and safety investigators are looking into the incident. NEW ZEALAND - The woman whose body was found on an Auckland property yesterday suffered "horrific injuries'' when she was set upon by two large Rottweilers, police say. Chloe Jane Mathewson, 31, of Rosedale, was visiting the Redvale property on Rodeo Drive yesterday morning when she was attacked. Police investigating the circumstances of her death did not believe any other person was physically involved in it. Detective Inspector Greg Cramer says police had evidence that showed she was attacked by two of the three large dogs that belonged to the owner of the property. The three dogs were destroyed yesterday after being removed by Animal Control staff. The 52-year-old man dog owner was helping police with their investigation, Mr Cramer said. It was too early to say what the final outcome of the investigation would be and whether any charges would be laid, he said. A neighbour, Mark McCarthy, said the property was a five- to six-acre lifestyle block. He said recently, police were called to the property after the dogs allegedly attacked cattle in the area. court advocate reports, and other sources. SOUTH DAKOTA -- The pit bull that bit a Sioux Falls Police officer Tuesday had up-to-date shots, SFPD spokesman Sam Clemens said. The officer was bitten on the hand, which broke his skin and bruised his hand before he shot the animal between its head and neck from a distance of between one and six inches, Clemens said. The officer encountered the animal just before 4 p.m. near 12th Street and Prairie Avenue after watching the animal chase after an 8-year-old boy. The dog was on a leash held by an 18-year-old woman when the officer saw the boy running from it, Clemens said. “It looked like she was having a hard time controlling the dog,” Clemens said. The boy made it behind a fence, at which point the officer tried to get the dog into his patrol vehicle, Clemens said. That’s when the bite and shooting occurred. The animal ran about a block, back to its house, but was taken to a veterinary clinic and euthanized due to its injuries shortly thereafter. The boy told officers the animal had bitten three other kids, but Clemens said those victims have not been located. The incident will be reviewed by the SFPD’s professional standards unit, which looks into any case involving use of force by an officer. Because the dog was on a leash and had up-to-date vaccinations, no charges are likely, he said. The last time an officer shot an animal was last June, when two pit bulls running loose reportedly attacked a man playing basketball near 14th Street and Beadle Greenway Park. The officer shot one of the dogs when it approached him in a threatening manner. GEORGIA -- A toddler who slipped outside through a doggie door was mauled to death by her family's seven dogs in the backyard while the attack went unnoticed by the child's mother and other relatives inside their home, a southeast Georgia sheriff said Thursday. Bryan County Sheriff Clyde Smith said the child's grandmother told investigators she was lying in bed when she heard the pit bulls and pit bull mixes barking, and she looked outside her window to see them dragging the girl. Smith said she began yelling, "They're killing Monica!" It was too late. 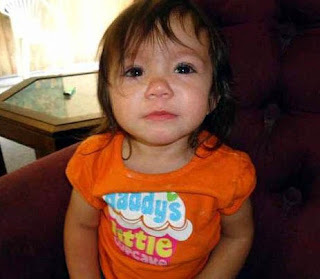 Monica Renee Laminack, who would have turned 2 on June 1, was dead by the time an ambulance arrived Wednesday evening. Animal control officers used drugs to euthanize the dogs at the home on a rural road in tiny Ellabell, about 30 miles west of Savannah. Deputies found the girl's shoes, diaper and shredded clothing scattered across the fenced-in yard, Smith said. "They had dragged the child all over the yard. ... They tore her clothes all up," Smith said. The toddler lived in a modest, two-story house tucked away from the main road. The sheriff said four generations of the same family shared the home, including the child's 18-year-old mother, grandparents and two uncles who are still young boys. The girl's grandmother, Michelle McIntyre, sat weeping on the tailgate of a pickup outside the home Thursday. Summer Laminack, the child's mother, sat next to her staring silently at the ground. "She's in shock," Barbara Brauda, a friend who was visiting the family, told The Associated Press before a man approached and asked a reporter to leave the property. "She hasn't been doing a whole lot of crying because she's still numb." The sheriff said at least three adult relatives were inside the home when the dogs killed the girl outside. No criminal charges had been filed Thursday. Smith said he expects charges will be brought after he's had a chance to discuss the case with the district attorney and the girl's family has been given time to hold her funeral. "I can see child neglect at the very minimum," Smith said. Relatives told investigators the dogs that mauled the child were essentially family pets — a mother dog and six offspring from a litter she had about 16 months ago, the sheriff said. The dogs had their own doggie doors that let them come in and out of the house as they pleased. The family told deputies the dogs had never attacked a person, though one of them might have killed a cat, Smith said. He said relatives insisted the toddler would play with the dogs and even "use them as pillows while watching TV." Smith said the dogs looked healthy and well-fed, and investigators found no signs they were being used as fighting dogs by their owners. "They said they have never been aggressive to other people," he said. "Why they got started I have no idea." COLORADO -- Boulder police Wednesday released the final findings of the department's internal investigation into the New Year's Day shooting of an elk on Mapleton Hill by two former officers. The 42-page report concludes no other officers or department employees were involved or aware of the two cops' plans. 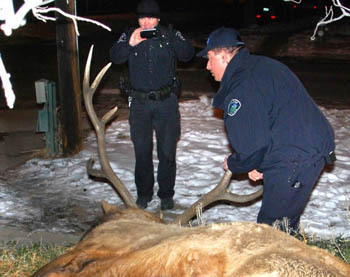 Former Boulder officers Sam Carter, 35, and Brent Curnow, 38, are facing nine criminal charges each -- including three felonies -- after prosecutors say text messages between the two show they planned to kill the elk as a trophy. On Jan 1, Carter, who was on duty, shot the elk near Ninth Street and Mapleton Avenue with a shotgun, and Curnow, who had called in sick, came to haul the carcass away in his pickup truck, according to police. 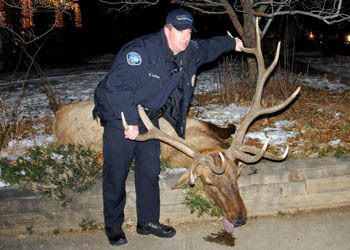 Carter initially told police the elk was injured and that he felt it needed to be put down. But Carter never reported the shooting to his supervisors, and a necropsy of the elk meat showed no signs the animal had been injured before it was shot. 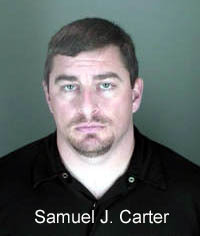 In addition to the criminal charges, the Boulder Police Department launched an internal investigation into Carter, a six-year veteran, and Curnow, a 14-year veteran. Both resigned in late January before the findings of the investigation were published. According to the report, the investigation continued despite their resignation because "a final finding would be beneficial to the department and the community. ... In such a case it is beneficial to complete the investigation to create a formal record and bring some closure to the incident." Internal investigation reports are typically not made public, but the department made this report public due to the high-profile nature of the case and the fact that the two officers resigned. According to the report, a 12-member review panel unanimously recommended the allegations against Carter and Curnow be sustained, and Boulder police Chief Mark Beckner agreed with the recommendation and entered the findings into their personnel files. Mountain View Road in Boulder. But the report also said no other Boulder police officers were involved with or aware of the plan, and it found that no other officers or employees should be subject to internal discipline. In addition, the report said, "Members of the department have been subjected to public ridicule about the incident while trying to perform their normal duties. ... After the shooting, the officers who worked with Carter and Curnow were shocked, disappointed, and angry they would do such a thing." Although the report said some employees overheard comments from the officers about shooting the elk in advance of the killing, "The context in which these statements were made did not lead those employees to believe either officer would illegally or without justification shoot the elk." According to the report: "Both officers were hunters, as were other members of the department, and would often talk about hunting, so this type of conversation did not seem alarming. Often, job related joking occurs at briefings to start the day, so it is not unusual to hear officers make statements in jest. As one officer put it, Carter was always making brash statements in briefing but never did any of the things he joked about." One officer told investigators that Carter was "full of bravado," and that things he said needed to be "taken with a grain of salt." Officers also said in some cases Curnow and Carter mentioned killing the elk but did so in front of officers who liked animals as a way to "razz" them. The exhaustive report details the department's investigation into its officers and chronicles the text-message exchanges -- many of which already have been published -- between the two officers as they planned the kill. 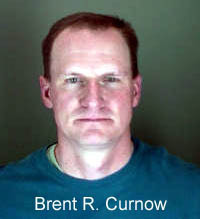 In one text exchange with Curnow on Jan. 2, a Boulder officer asked Curnow, "You got elk meat now?" But an investigation showed that a watch commander had asked the officer to send the text to Curnow because police were still trying to figure out who had shot the elk and were trying to get in contact with officers who were known to be hunters. The department learned shortly after that text was sent that Carter and Curnow were responsible for the shooting. An officer who said she was friends with Carter heard Carter had put down the elk from a Boulder County sheriff's deputy, Jeff George, the next morning. George, who was on the scene after the shooting and helped Carter and Curnow load the elk into the truck, said in a separate internal investigation by the Sheriff's Office that he thought the kill was authorized. Later that day, the Boulder officer was asked by a sergeant if she knew anything about the elk shooting, which is when she told him about Carter. She said she initially did not report it because she assumed the kill was authorized. The officer said she had seen Carter and Curnow put down animals in legitimate cases, and in one of the cases she drove Curnow's pickup to the scene and helped them load a deer that had been injured. In the report, officials from Colorado Parks and Wildlife said it is not unusual for members of law enforcement to take home road kill, and it is not illegal as long as the carcass is a legitimate road kill or euthanization and they apply for a permit within 72 hours. 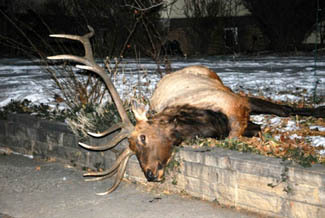 According to the report, Curnow applied for a permit but reported the elk was killed in an accident. 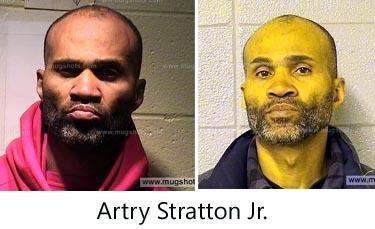 Both men are due in court for case management conferences April 4. Evans: "It's not about the elk"
PENNSYLVANIA -- A Lower Burrell man pleaded guilty Wednesday to chopping off the head of his grandmother's dog last year. Greg Novick Jr., 25, was sentenced to serve up to 23 months in jail, but could be released immediately once he can find a place to live. Westmoreland County Judge John Blahovec rejected an effort by Novick to move in with his grandmother. “I'm really reluctant to approve your release to live with your grandmother without some sort of treatment. It just makes me nervous,” Blahovec said. Novick was arrested in February 2012 and charged with cruelty to animals and trespassing for the incident at his grandmother's home. Police said Novick lured the dog into the kitchen where he used a hatchet to kill the animal. 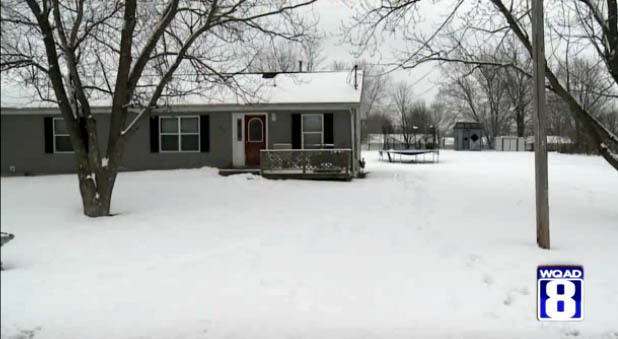 His grandmother, Dolores Novick, told police her grandson admitted he put the dog in a burn barrel and that she found the decapitated pet the next morning by following foot prints in the snow. 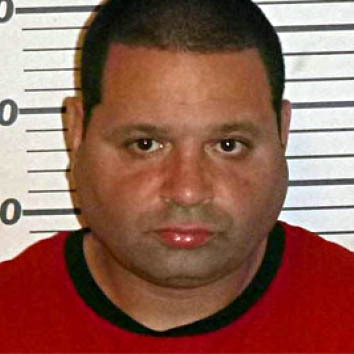 In court Wednesday, Gregory Novick CLAIMED the dog previously threatened his grandmother. “The dog was biting her on several occasions so we got rid of the dog,” Novick insisted. Novick said he wanted to live with his grandmother upon his release from jail, but assistant District Attorney Judy Petrush said the plea bargain that was offered and eventually accepted had to include a provision that barred him from having any contact with his grandmother's home. Novick has already served a year in jail and is now eligible for parole. Blahovec said Novick can be released as soon as he finds a place to live. In addition to the jail time, Novick was ordered to serve five years on probation. Guyana: Little boy, 8, mauled by Pit Bull. Neighbor who rushed in to help also attacked. 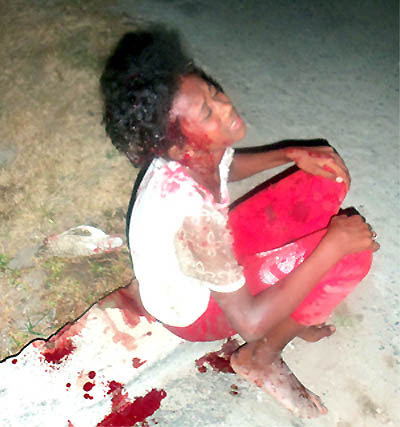 GUYANA -- Whilst her relatives and peers were enjoying Phagwah and are preparing to celebrate Good Friday and Easter Monday, Johan Carter, is in severe pain after she was attacked and ravaged by a Pit Bull Tuesday afternoon. The owner of the dog had carelessly left him loose and his gate open. He is said to be a Guysuco employee and taxi driver, who was not at home. 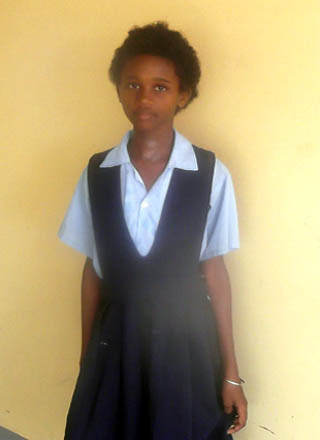 Johan Carter, 8, of Main Street, Cumberland, East Canje Berbice, and a grade three student of the Cumberland Primary School, had to be rescued by a neighbour, who in turn had to run for her life after the animal turned on her. According to reports, around 16:00 hrs on Tuesday the child was returning home from the shop a few houses away when the dog raced out from the yard and attacked her. She made a dash for it but was overpowered by the dog which pounced upon her, throwing her to the ground and started to bite her about her body. Her unending cry for help attracted the attention of a neighbour who was nearby and who quickly raced to the scene. Her approach and shouts managed to distract the animal, but she had to run for her life after the dog turned on her. By that time other neighbours raced to the scene with various implements and warded off the animal. The child was picked up bleeding from the wounds and rushed to the New Amsterdam hospital where she was admitted and given emergency treatment. Two Sundays ago another child in the district was mauled by a pit bull which attacked and bit her in her head. 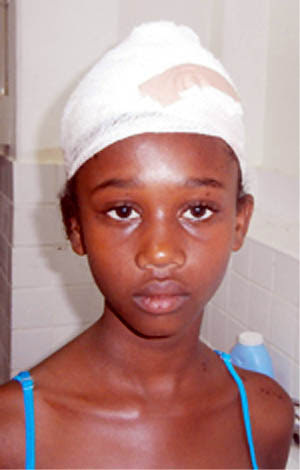 Amanda Phillips, 11, called “Manda” of Sookhu Street, Number Two village, East Canje, Berbice, a grade six student of the Sheet Anchor Primary school was attacked and bitten by a dog owned by a Dr. Roy Nankumar of the same street. The child received 10 sutures and is still hospitalised in the New Amsterdam hospital. She was allowed to write the Grade Six Assessment Examinations from her hospital bed. ARKANSAS -- An Austin-area woman arrested last summer on multiple charges of cruelty to animals has been found guilty of some of those charges and will go before Circuit Judge Sandy Huckabee Friday for sentencing. Jurors heard testimony for three days before deliberating four hours on March 15 and finding Sandra Nance (aka Sandy Nance), 57, guilty of five counts of cruelty to animals and her husband Marcus Nance, 62, not guilty. Both were acquitted of aggravated animal cruelty, a felony charge that implies animal torture. The jury was not able to reach agreement on a sentencing recommendation after two hours of deliberation so Huckabee will decide that on Friday. The judge also will decide what will become of the 137 dogs that were seized on June 28, 2012, by the Lonoke County Sheriff’s Office and the Humane Society of Pulaski County where they are still held. Until the judge says otherwise, they still belong to the Nances, said Lonoke County deputy prosecutor Ben Hooper, who handled the case with deputy prosecutor Paula Jones. Jones also works part time for North Little Rock prosecuting animal cases. The Nances were represented by Jerry Sallings and Seth Jewell, both of Little Rock. Essentially, Sandra Nance was convicted for keeping her dogs in poor conditions and not providing them with veterinary care, but not of running a puppy mill but. She raised her puppies in kennels about 100 feet from her home and sold them at a store in Searcy. She raised several breeds including Airedale terriers, schnauzers, Chihuahuas as well as English bulldogs which she said could sell for as much as $3,500 each. The prosecution brought in veterinarians who testified to the poor conditions in which the dogs were kept and to their deteriorated health from lack of proper medical care. Sandra Nance’s defense was that she was able to provide proper care herself. Cruelty to animals is a misdemeanor. Nance could be fined from $150 to $1,000 for each conviction and be sentenced to one day to one year of community service or one day to one year in jail. A spokesman for the Humane Society said the dogs will be adopted if the judge gives his approval. On June 26, 2012, an anonymous caller notified employees at the Pulaski County Humane Society (PCHS) that there were dogs at a location on Sentell Loop in Austin that were housed in the sun, with no access to shade, and in excessively hot temperatures. PCHS referred the caller to the Lonoke County Sheriff’s Office. someone had also called there about the condition of some animals at that same location. Kay Simpson, Director of PCHS and also a certified cruelty investigator, asked her board president, Christine Henderson, to drive by the location and check on the dogs. After Henderson expressed some concern, a decision was made that Simpson and Dr. Teresa Medlock, a PCHS veterinarian, would go to the property to see if they could offer the owners any assistance with the dogs. Two days later, Simpson, Henderson, her husband Jack Henderson, and Dr. Medlock traveled to the Nance property. While en route, Simpson contacted the Lonoke County Sheriff’s Office for assistance, and Sgt. Dennis Sanderson was dispatched to assist the group. Simpson also contacted Nance and asked her to meet them at her property. At that time, Nance was working in a store she owned, “Smoochie Poochies,” located in Searcy, where she sold puppies and dogs from her kennel. When Nance arrived, Simpson told her about the calls they had received and asked Nance if they could walk through the kennel. Nance agreed and during the walk-through, Simpson noticed that many of the cloths used to provide shade for the dogs were tattered, shredded, and hanging down in the cages. She also noticed some large fans through the area that were not working, and one working fan that was tilted upward. When asked, Nance stated that the fans had stopped working a couple of days prior. Simpson also noticed a misting system that was not spraying the dogs. Simpson also noticed that while some of the dogs had clean water bowls, others had pale-green-tinted water or dark green, blackish water. were panting but were not barking much, and others were lying in holes they had dug to stay cool (The temperature that day reached 110 degrees). The women also noticed that a large number of the dogs were “brachycephalic dogs,” meaning they have smaller snouts and have a harder time breathing in extreme heat or cold. They also noticed that some dogs had extremely matted fur, which added to the dogs’ heat stress. Simpson and Dr. Medlock both expressed concern about the dogs’ well-being and thought it was best to remove the dogs from the property. As a result, Sergeant Sanderson contacted the Lonoke County prosecutor, who then came to the Nance property. After seeing the dogs and the conditions of the kennel, the prosecutor authorized PCHS to seize all the dogs on the property. Felony counts of aggravated cruelty to animals, in violation of Arkansas Code Annotated section 5-62-104, and ten Misdemeanor counts of cruelty to animals, in violation of Arkansas Code Annotated section 5-62-103. The jury found Nance guilty of five misdemeanor counts of cruelty to animals. After the jury was unable to agree on sentencing, the circuit court dismissed the jury and scheduled a hearing to take up the issue of sentencing. On March 29, 2013, the court held a sentencing hearing and sentenced Nance to 100 hours of community service at an animal shelter and payment of a $500 fine; both to be completed within sixty days from entry of the court’s order. A written order reflecting the bench ruling was filed of record on June 6, 2013. 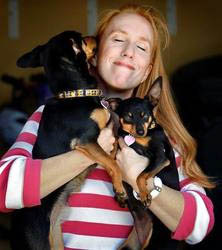 The court ordered Nance to pay costs to PCHS of $6,425; divesting Nance of custody of the five dogs that she had been convicted of abusing; and ordering the return of the remaining dogs once Nance complied with the court’s orders. From the media stories, the return of the other dogs came about because the prosecutor did not address it during trial. Also, the judge randomly selected 13 out of 160+ dogs to be included in trial so the jurors never got to see/hear about the other 150 dogs involved in the seizure. Sandy Nance has now become a vocal online advocate for fringe groups such as the Calvary Group, has started her own Facebook page called Animal Owners Under Fire, in which she and others post stories of animal cruelty cases and look for every reason to dismiss the accusations ("The don't look skinny to me", "The shelter just needs more animals to sell so they stole these! ", etc.). When a person is found guilty, they make excuses about corruption, etc. OKLAHOMA -- A woman critically injured in a pit bull attack says she remembers everything about the mauling. Beverly Wright has been in the hospital for a week. 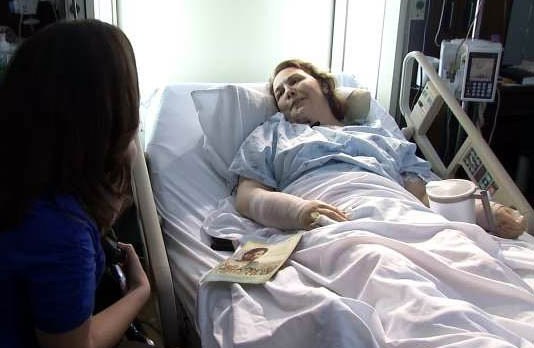 She's one of two victims attacked that day, and she invited us to her hospital room to share her story. She said she's in pain, but feels a lot of love, right now, from the worldwide brotherhood of Jehovah's Witnesses concerned about her. "It's global, and you don't know that until something happens and you feel that love and you get that love," Wright said. She recounted the dog attack that hospitalized her. "It's not 'Beware of the dog,' it's 'Beware of the beast that is going to kill you,'" Wright said. Wright was passing out flyers with her friend, 78-year-old Irene Parker, in north Tulsa. Parker knocked at one house (2027 North Lewis Place) and a pit bull barreled past its owner to attack her. "I just heard screaming, so I ran down there," Wright said. She said she got the dog in a headlock and pulled him off, but it lunged back at Parker. Wright said she then punched and kicked the dog, and grabbed a baseball bat the owner was holding and slugged the dog. The pit bull turned its rage from Parker to her. "When he started dragging me and his head was shaking," Wright said, "I saw him ripping my leg and it was awful." She didn't know it, but Mike Harrell, who works nearby, heard her screams and he came with his gun. "I just started screaming 'Jehovah, Jehovah. Save me!' and pow," Wright said. Doctors stopped counting Wright's stitches at 300. The bites span from her scalp, down to the ear, and on both arms and her legs, where the dog bit through the bone. Wright said she's not fazed by this attack and can't wait to return going door-to-door. Her right leg is in bad shape. Her wounds have to heal before she can start rehabbing it, but she knows there's nerve damage and a long road to recovery. A special contribution fund has been set up in her name. You can contribute to the Beverly Wright Special Contribution account at any Bank of Oklahoma branch. GEORGIA -- A 21-month-old toddler has died after being attacked by seven pit bulls in coastal Georgia Wednesday, according to police. Bryan County Sheriff Clyde Smith says the little girl was mauled in the yard by dogs her family owned. Authorities say the unidentified girl's grandmother was asleep when she heard a commotion and saw the girl being attacked as she looked out of her window. Authorities say the dogs, pit bulls and pit bull mixes, have been euthanized by Bryan County Animal Control. At around 6.30pm, police received a 911 call from a home on Elm Drive in Ellabell about a toddler who had been attacked by a pack of dogs, Savannah Morning News reported. 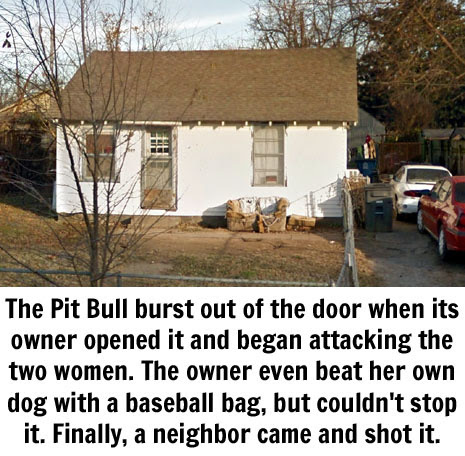 The victim's grandmother, who was napping at the time, woke up to see the pit bulls mauling her granddaughter, but she could not stop the attack. The child was pronounced dead at the scene. It was unclear Wednesday night if charges would be filed in the case. First responders said that by the time they arrived at the scene, the child's body was already cold, suggesting that she has been dead for some time. Bryan County Deputy Sheriff James Beatty told the News that the girl's 12-year-old brother may have taken her out to play in the backyard and either forgot she was there, or thought she had returned. Another way the toddler could have left the house was through the doggy door. According to officials, the family had nine dogs in total, and the child often played with all of them. The two dogs that were not involved in the attack were spared. 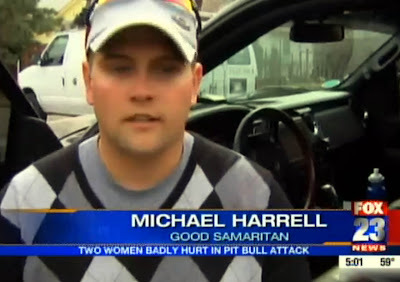 They were not pit bulls. 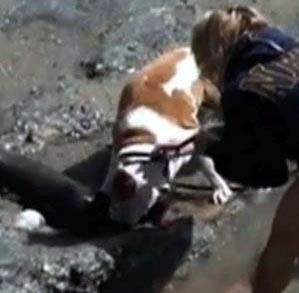 CALIFORNIA -- Gun advocates are calling for background checks on dogs after former astronaut Mark Kelly’s daughter’s dog killed a baby sea lion. Kelly, the husband of wounded former congresswoman Gabrielle "Gabby" Giffords, has been campaigning for gun controls, including background checks for gun buyers. On Saturday, Kelly's daughter was walking her dog on a California beach when the dog bolted, ripping the leash from her hand and fatally attacking a beached baby sea lion. 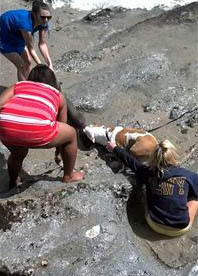 Video showed Kelly's daughter and two other women struggling for several minutes to pull the dog off the sea lion. Kelly then arrived and shook the dog's head until it released the mammal, which later died. killer dog off an innocent animal. Laguna police said they wouldn't file charges because the dog had been leashed and was legally on the beach. The National Oceanic and Atmospheric Administration also says it doesn't expect to take legal action. Marine animals are protected by federal law. [If you are not in control of your animal, if it "rips the leash out of your hand" to run and attack and maul something to death then you are in violation of leash laws. You must maintain control over your pet when walking it. Clearly, she did not. The gun rights advocates who have commented on Kelly's Facebook page today included several who suggested that background checks be considered for dogs whose owners can't control them, or those that are a threat to the public.